Take care of everything you need to fully experience Crested Butte all in one place. Grocery Delivery, Housekeeping Services, Gift Baskets and Luggage Shipping are just a few ways to truly make the most of your time in Crested Butte. Call on Specialty Services next time you come to Crested Butte because you deserve the best! Sharon Duran and Alfred Tafoya are happy to announce their purchase of Crested Butte Specialty Services. Try our Grocery Delivery Service and start your vacation off right away with a fully stocked refrigerator. We shop at the Gunnison grocery store to get the freshest foods and best prices. For your liquor requests, we shop at the finest bottle shop in the Gunnison Valley offering a wide selection of wine, liquor, domestic beer and craft beer. 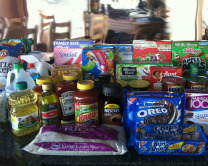 Simply email your grocery list to info@cbspecialtyservices.com and have your groceries ready by the time you arrive into Crested Butte! If you need it we can get it. Wine, beer, ice, restaurant food, prescriptions and dry cleaning are just a few things we can gather and deliver for you. Don't interrupt your vacation with mundane errands, let us do the work. Surprise someone special with a nice touch of a custom gift basket. Gift baskets are carefully constructed with exactly what you want inside. Wine, champagne, cheese, sausages, snacks and even gift certificates can be included. We'll deliver before the recipients arrive so they are surprised upon arrival. Before you travel to Crested Butte, pack your bags and have them shipped to your final destination and they'll be waiting for you when you arrive. Bought too much stuff? We'll ship it back to you. Don't worry, we'll take care of the packaging too. Make your Christmas Vacation truly magical with a decorated Christmas tree upon arrival. Our decorators are very detailed orientated and will set up your tree just right. Have your Christmas gifts shipped to us and we'll place them under your tree before you arrive. Have a question or request? Please let us know and we'll be happy to help.